AIKEN, S.C. (Dec. 8, 2016) – Registration is now open for the Savannah River Site (SRS) 2017 public tour program. More than 1,000 seats are available during 22 tours to be held throughout the year. The program is managed by Savannah River Nuclear Solutions (SRNS) for the Department of Energy Savannah River Operations Office. A significant change for this year is the offering of four historic tours hosted in partnership with the SRS Cold War Historic Preservation Group featuring the former town of Ellenton, C Reactor and the site’s Curation Facility. Traveling within large and comfortable commercial buses, driving tours provide members of the public with an opportunity to see many of the historic and operational facilities at SRS that were responsible for the production of plutonium and tritium during the Cold War with the Soviet Union. 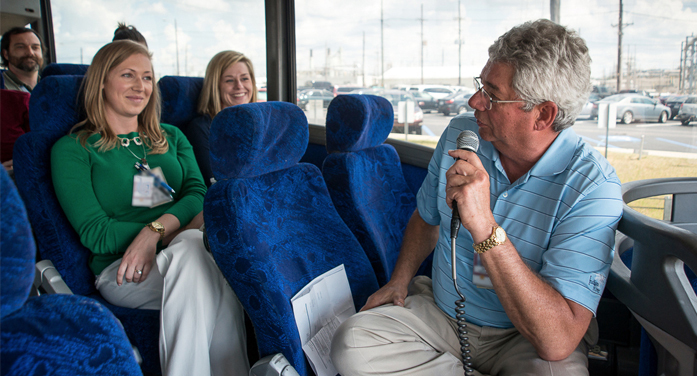 Tour participants also learn about the site’s current activities and future missions. In 1972, SRS was designated as the first National Environmental Research Park. Encompassing 310 square miles, endangered bald eagles and red-cockaded woodpeckers can be found at several locations throughout the site. SRS is also home to alligators, coyotes, deer, turkeys, otters, armadillos and many other animal species. The tour concludes with a stop at the Savannah River Ecology Laboratory where the mission of the lab is explained and several types of animals are presented..
Each tour starts at the Aiken County Applied Research Center, located off Highway 278, near New Ellenton and is free to members of the public. To register, visit www.srs.gov/general/tour/public.htm. If you experience difficulty registering online, call (803) 952-8994. Each tour begins at 12:30 p.m. and typically ends at 4:30 p.m., accommodating up to 50 people. Participants must be 18 years of age or older and U.S. citizens. Seats are limited and are filled on a first come, first served basis. Large groups can be accommodated by calling the above phone number.